Discover Our Exciting Summer Camp Opportunities in Ooltewah! At Discovery Point Hunter Road, we know how important it is for children to take full advantage of summer. Our summer camps in Ooltewah offers an excellent opportunity for children to have new experiences, make new friends, and create memories that they will cherish for life. Our aim is to offer a structured program that allows them to have a blast while learning important life lessons and developing valuable skills that they can take back with them to the classroom. 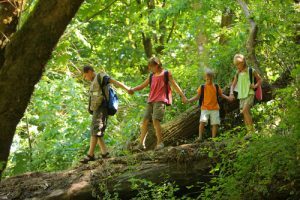 If you think your child could benefit from exciting hands-on activities and adventurous excursions this summer, read below to learn more about what we have planned for our campers in Ooltewah. Our summer camp program for 2019, called “Mighty Me!”, encourages campers to become their very own heroes by honing in on their natural talents and practicing teamwork, creativity, kindness, and more. We’ve created a program that’s structured around ten pieces of children’s literature, all with their own unique themes. These themes inspire the activities and excursions for the week, which we’ve termed “mighty missions.” Through these weekly mighty missions, campers can look forward to learning more about themselves and the world around them. With the help of our encouraging teachers and staff members, your child will gain confidence, make friends, and have a better appreciation of his or her capabilities. Our goal is for every camper to understand how to find the “superhero within” and use those superpowers for good. And of course, we want our campers to be able to relax and have some good ol’ summertime fun. Learn more about our summer camps in Ooltewah today by calling (423) 344-4422 or stopping by Discovery Point Hunter Road for details about our child care center’s summertime offerings.